Don't you just love it when a "Good Plan" (or fate, coincidence, the gods - whatever you'd like to call it) comes together? 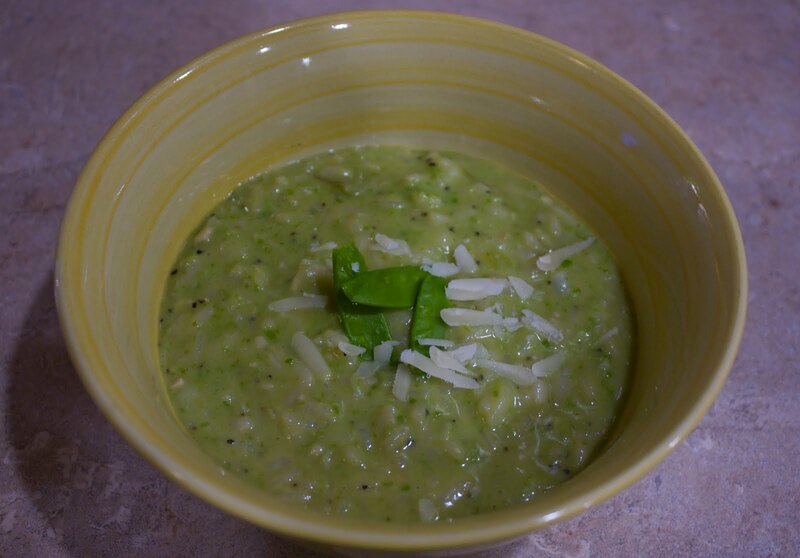 As luck would have it, I recently stumbled across a recipe for Pea Risotto from Disney's California Grill restaurant. Now, I LOVE a good risotto. If I had to choose a last meal, risotto would be right up there - along with a really good pizza, tiramisu and really good chocolate (and maybe even Mascarpone Waffles from Kouzzina!). AND - then to top it off - last week's CSA delivery from Limestone Farms had peas! Perfect, my two favorite things combined: Fresh veggies and Disney food! What more could I ask for?? Well, other than someone to make it FOR me !! So, off I went - Dinner Time! We would have a couple of substitutions along the way, since I was feeling somewhat lazy.. we'd swap freshly grated Parmesan cheese for the Manchego, 1% for the heavy cream (I KNOW! Boo! But, healthy reasons mandate this!) and a healthier butter substitute. First step was shelling all the peas. Ok, that took WAY longer than I want to admit. There must be a trick to it. NOTE TO SELF: Google "how to shell peas" before working on the remaining ones! 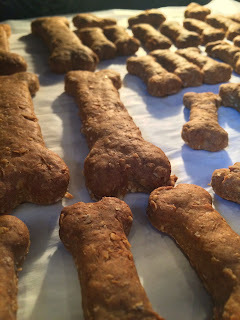 They were super quick to cook, and into the blender they went! Once that was set, it was time to make the rice. Risotto really isn't that difficult to make, its just a bit time consuming. 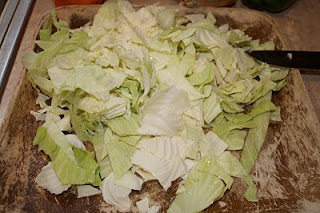 But, honestly, it went much quicker than I thought it would - minus the pea shelling! 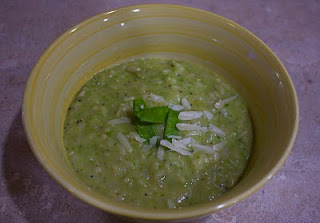 And, then it was time to throw in the pea puree, some parmesan, milk and pepper! Top it all with a fresh pea pod and sprinkle of cheese... and Voila! DINNER! And the ultimate test: When called for dinner, Hubby said, "Wow! That actually smells good for something with peas"! I loved it! Son liked it. And the picky girl even ate it - with a comment that it looked mighty funny! Final Verdict: 3.5 thumbs up (the girl is the only downer here!). I'll be making this again soon! PS. I skipped the ice bath and straining of the peas. No need to get THAT fancy in this house! Here's the original Disney recipe for those who'd like to try it at home! 1. Bring a medium saucepan of water to a boil over high heat. Add peas and sugar to water. Cook 2 minutes, then plunge peas into an ice water bath to stop the cooking. 2. Place cooked peas and 1/4 cup of vegetable stock in food processor and puree. Once the mixture is smooth, pour through a fine-mesh sieve into a medium bowl, pressing puree through the sieve with the back of a spoon. Discard solids. Set pea puree aside. 3. Place remaining 6 cups vegetable broth in a medium saucepan over medium-high heat. Bring to a slight boil, then adjust heat to medium to keep at a simmer. 4. Heat oil in a wide-bottomed saucepan over medium heat. Add onion and garlic, and sauté for 3 to 4 minutes, or until onion is translucent. Add rice; sauté for 2 minutes, stirring constantly with a wooden spoon. 5. Slowly ladle 1/2 cup simmering broth into rice, stirring constantly until most of broth is adsorbed. Continue adding broth, 1 ladleful at a time, stirring frequently between additions and waiting until rice looks slightly dry before adding the next ladleful. 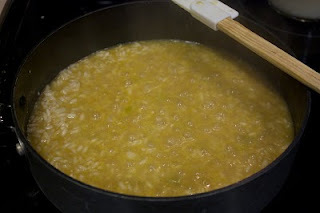 When most, but not all, of the broth is absorbed, taste the risotto. When risotto is done, it should not be crunchy at all, but still slightly firm. Add remaining broth, if needed, until risotto is al dente. 6. 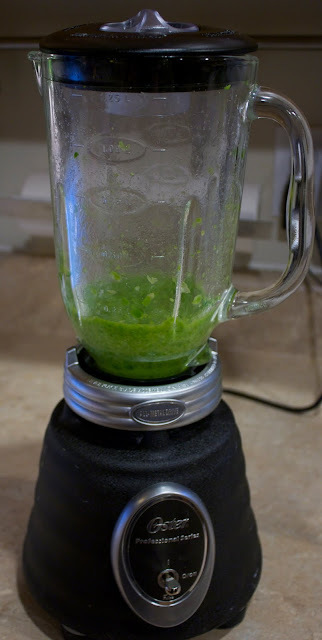 Remove from heat, and add the pea puree, heavy cream, manchego cheese, butter, and pepper. 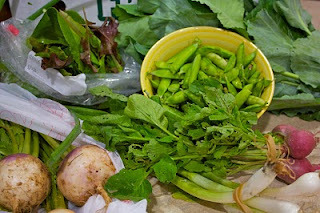 Taste, then add salt to taste (some broths are salty, so the amount of salt you add will vary). Stir to combine. Seriously? You made that for dinner and the kids ate it? CONGRATULATIONS! I think my teenager would take one look at it (though to me it looks great) and say, "Yuck! I'm not eating that!" Thanks Debbie! And, yes, the kids actually ate it!! Overall both of them are very good. And since this wasn't THAT strange (peas and rice), they were ok with it! PLUS, dinner was so late they were really hungry- I'm sure that didn't hurt! !